Spectrem’s new study on socially responsible investing analyzes how wealthy investors are currently perceiving and using these investments in their portfolios, and offering indications for their use in the future. New investment opportunities continue to emerge that provide affluent investors the opportunity to generate healthy returns while also making a positive impact on the environment, society or their community. Socially responsible investing totals an estimated $3.07 trillion out of $25.2 trillion in the U.S. investment marketplace, according to the Forum for Sustainable and Responsible Investment. For some investors, the social responsibility of an investment matters. Will Americans spend more for investments from companies that support social causes or are socially responsible in some way? Socially responsible investments encourage corporations to improve their practices on environmental, social and governance issues. Fifty-five percent of investors under the age of 35 feel socially responsible investing will cause other companies to embrace social responsibility in their practices. This is becoming increasingly important to investors. 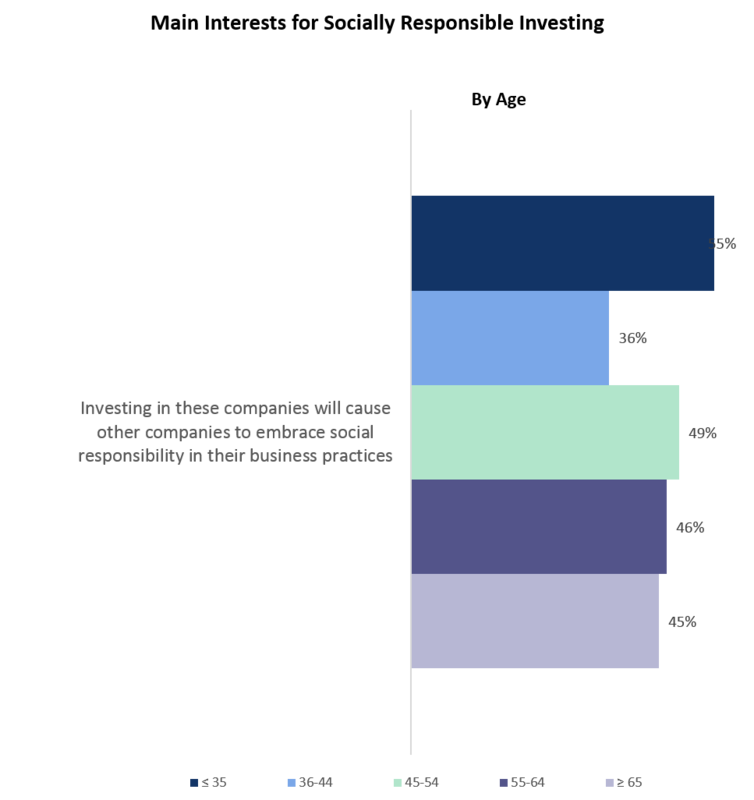 For example, 36 percent of the Mass Affluent consider social responsibility when selecting an investment. For all of the investors, the younger the more likely there were to indicate being familiar with socially responsible investing. Those 35 and younger rated highest on the knowledge scale for “Impact Investing” and “Microfinance”. While those between the ages of 36-44 were most familiar with the term “Socially Responsible Investing”.